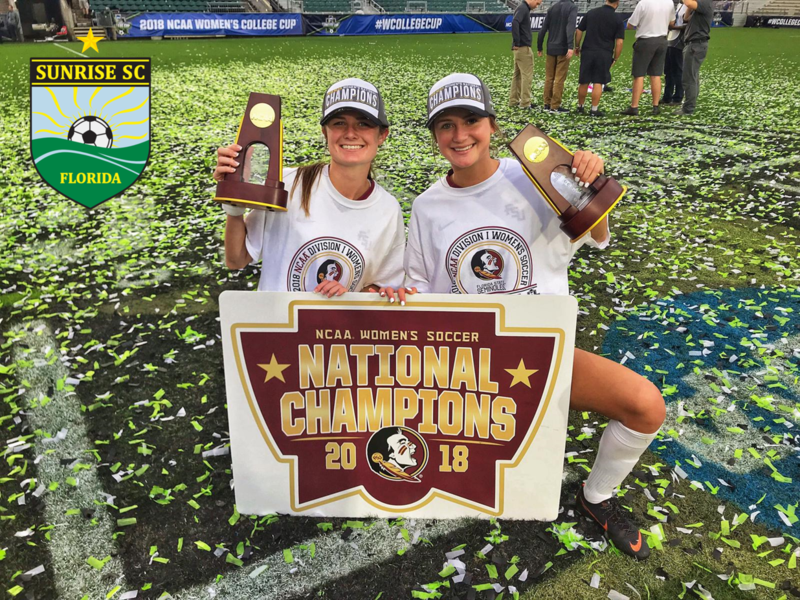 Sunrise SC Alum Dallas Dorosy carries Florida State University to National Championship! From local Sunrise SC product to National Championship Hero! Congrats to FSU on winning the National Championship. Special congrats to our three Sunrise players on FSU - Seniors Dallas Dorosy and Macayla Edwards, and sophomore Bella Dorosy. Getting to the National Championship match was no easy task. In the Seminoles final game of the season, they played the Hurricanes in Miami. It was an important match. A win and FSU would grab the number 3 seed in the ACC Tournament, a loss and they drop to number 7 and would face a brutal climb. FSU played an excellent game against Miami, dominating most of the game and getting off over 20 shots, but the Miami defense and goalkeeping was superb. The game went to overtime and in the first few minutes, the 'Canes put their one shot of the night on to the net for the victory. With the loss, FSU dropped to the number 7 seed in the ACC tournament. Despite the sting of losing an important match, the Seminoles and Coach Krikorian showed complete class and took the time to take a picture with the Sunrise 2009 team. Maybe that was the lucky charm. Because since then, FSU was simply unstoppable. In the ACC tournament, FSU opened up against #2 Duke and won 1-0. Then, they defeated #3 Virginia. That set up the ACC championship against #1 North Carolina. At that point in the season, North Carolina had not allowed a goal in one month. That is when Sunrise alum Dallas Dorosy went to work. Dallas scored two goals in the first half to give FSU a 2-0 lead. UNC fought back to make it 2-2, and then in the closing minutes, Dallas set up the winning goal to give FSU the ACC title. That championship was crucial because it set FSU up to be one of four #1 seeds for the NCAA National Championship tournament. FSU opened up against Loyola of Chicago and won the first match 1-0. In the second game, USF jumped out to a 1-0 lead. Things looked bleak against the physical USF team. But that is when Coach Krikorian put in his secret weapon, Dallas Dorosy. Dallas came into the match midway through the first half and quickly scored to tie the match and put the momentum back on FSU's side. Two more goals and FSU won 3-1. But life does not get any easier in the NCAA tournament. As you work your way through, you face giant after giant. And that is what FSU ran into in the Sweet Sixteen, when they matched up against the 2016 National Champions, the University of Southern California. USC took a 1-0 lead into halftime. But again, to the rescue, came Sunrise alum Dallas Dorosy. Dallas scored to tie the match in the 64th minute. FSU would go on to win in penalty kicks to advance to the Elite Eight. Next up, the 2015 National Champions, Penn State. In a hard fought match, FSU knocked out the Nittany Lions 1-0. That win sent FSU into the College Cup where they would have to face the #1 ranked team in the USA, the defending National Champions, Stanford University. Stanford went into the match with a 45-game unbeaten streak. Stanford controlled the first five minutes of the match, but after that it was all FSU. The Seminoles won 2-0. And now, it was time for the National Championship. Having already defeated the 2015 (Penn State), the 2016 (USC), and the 2017 (Stanford) National Champions, it was only appropriate that the final would be against North Carolina. North Carolina is synonymous with women's soccer. Having won 22 of 36 championships. It was an even match, back and forth, and then, in the second half, in the 59th minute, Deyna Castellanos crossed the ball to a streaking Dallas Dorosy, who beat her defender and slid to knock the ball into the net for the lone goal of the game! Nine years of practicing three days a week at Nob Hill field paid off! FSU won the National Championship and Dallas was named to the All-Tournament team and she was voted the Most Valuable Offensive Player of the NCAA Tournament. It was a dream come true and it couldn't have happened to a nicer kid. Or at least she was a kid when she started with our Club. Dallas ended her college career the same way she ended her Sunrise career, as a champion! Dallas was one of three Sunrise players on the FSU team, and we are proud of all of them. Macayla Edwards, unfortunately, could not play. Macayla has suffered through a string of injuries the last couple of years. She did play this year but suffered a season-ending injury midway through the season. Bella Dorosy is just a sophomore and we are looking forward to watching her develop in the future. Congrats to our three players!